Scribner Book Company, 9781476724102, 256pp. "A thoughtful twist on the recovery memoir" (O, The Oprah Magazine) that explains the different ways bestselling author Martha Grimes and her son, Ken Grimes, recognized and overcame their addictions, now with two new chapters--one from each author. In this introspective and groundbreaking memoir of addiction, mystery writer Martha Grimes and her son, Ken Grimes, present two different, often intersecting points of view. Chapters alternate between Ken's and Martha's voices and experiences in 12-step program and outpatient clinics. 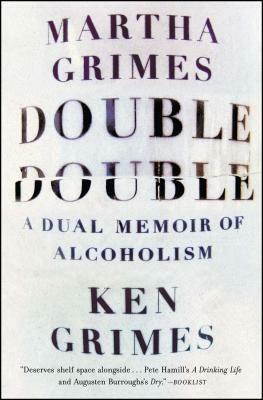 Written with honesty, humor, a little self-deprecation, and a lot of self-evaluation, Double Double is "an honest, moving, and readable account of the drinking life and the struggle for recovery. This brave and engaging memoir is a gift" (Kirkus Reviews). Bestselling author Martha Grimes is the author of more than thirty books, including twenty-two Richard Jury mysteries. The winner of the 2012 Mystery Writers of America Grandmaster Award, Grimes lives in Bethesda, Maryland. Ken Grimes works in the public relations industry and lives with his wife and children in suburban Maryland.